Saw this on DZONE and wanted to pass it along. There certainly are a number of companies that are looking for skilled people to work with some of these technologies. I think it would be interesting to see how these positions are being filled? I personally know very few people that have any experience with these data stores, let alone any significant experience. News about LevelDB has been making the rounds lately. It's another Google project and it definitely looks interesting. LevelDB is a key-value store in library form. It does not appear to be a complete product in and of itself, but can be utilized by many other products. One very interesting note is the fact the Basho is working on using LevelDB as one of the back end storage options for Riak! It looks like LevelDB would work well for those that are using the InnoDB back end currently. The Bitcast back end keeps all of it's keys in memory and thereby has some limitations as to how many values can be stored per node. InnoDB doesn't have this same limitation and neither does LevelDB. This really isn't about big nosql as such, I just was really fascinated by the fact that this company was putting their "secret sauce" out into the public. I mean, how many companies would do that! Obviously you would need their software too in order to recreate their entire service, but very forward thinking none the less. Good job guys! Sorry it took a week to get this posted, but here it is! View more presentations from nosqltips. 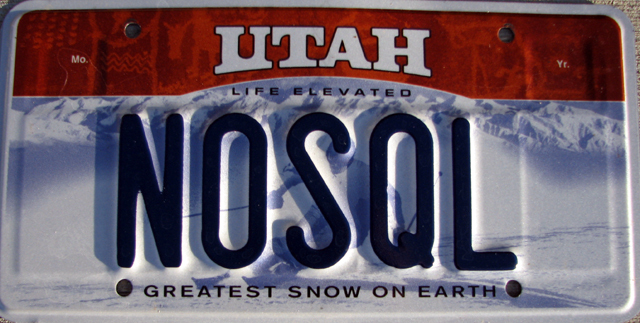 I got my NoSQL license plate! I'm presenting at Provo UJUG tonight and Murry UJUG tomorrow night. I'll be presenting on the overall NoSQL Landscape. This is a really high-level view designed to give users some background to the space, a comparison to the SQL space, and a breakdown of the NoSQL space, along with some detail of each category. I'll post the slides and video of the presentations a bit later. The video is not the best quality but I think it still works. I'll try this again another time, but with a different recording method. I thought I'd share a photo up my cluster setup. I have 7 Sun V20z servers. They are older, but total investment is < $1500 so that is pretty good. 6 are dual-single core servers and 1 is dual-dual. I can upgrade 2 more to dual-dual, but I need a firmware upgrade that is only available on service contract now. Some of the servers have 4G ram with 2-36GB 10K rpm drives and the others have16GB with 2-73GB 15K rpm drives. That doesn't give me much storage space, but a lot of ram. That's good enough for the kind of testing I'm doing. They are all running Solaris 10 U9 which is the first Oracle Solaris release. A couple of things I really like about Solaris are ZFS and Zones. Zones is an OS level virtualization technology. Zones are very lightweight and easy to set up and administer, especially in conjunction with ZFS. I currently have zones set up for Riak and Hadoop. I plan on setting up a number of NoSQL data stores and seeing how they operate, administer, and run on my cluster. 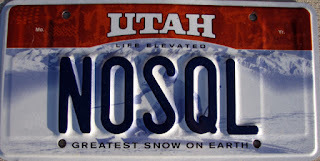 Come and see me give my NoSQL Landscape presentation on July 21, 2011 for UJUG. I'll post the slides here on the blog for distribution. I came across this today. It's an older post, but has some excellent resource links. I've read some of these, but need to read the rest. This is the best article that I've found on CAP. It's thorough and has been well reviewed by experts. 1) On a non-Partitioned or non-distributed system, you can guarantee Consistency and Availability. 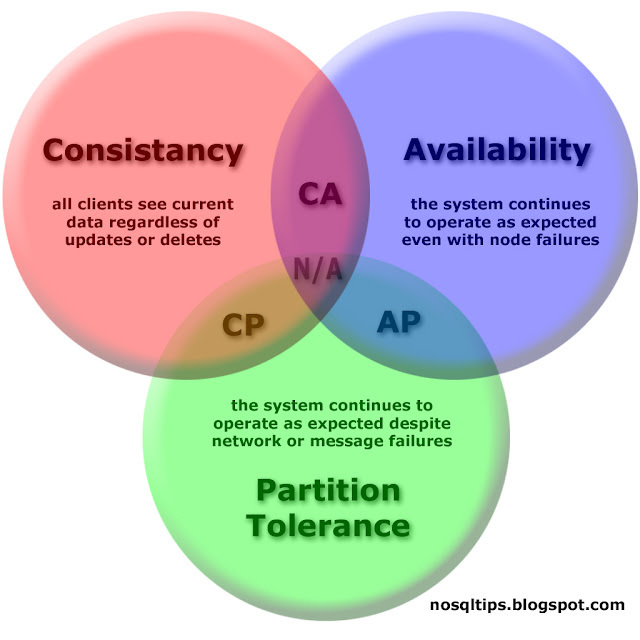 2) Once you introduce Partitions, then you have to choose between Consistency and Availability. You can't have both. Most companies will chose Availability over Consistency. note: Some systems claim that they can guarantee C, A and P. The caveat is that the guarantee does not apply to a single piece of data. It's still CA, CP, or AP, but the system can support multiple tunings at the same time. There are basically 4 ways you can integrate the use of NoSQL in your SQL application. 1) Just stick to SQL. The issue here is that there is likely something you need to do with your data that your SQL database is not efficient with. That may be why you're looking at some NoSQL data store in the first place. Just sticking with your SQL database may be valid depending on your needs. It is well known, safe, and has excellent tools support. There are definite drawbacks to splitting your data and bringing in a new and unknown data store. However, you're likely giving up something by sticking to SQL only. 2) Convert everything to NoSQL. This might be a real stretch, especially for a transactional application. Your data will need to be denormalized as a start. You really need to understand the limits of the NoSQL data store as well as the advantages that you'll gain. Going to NoSQL can be a bit of a culture shock. You're likely going to be better off looking to a column store for your choice as some things will at least look familiar to you. One of the big advantages is that you're not splitting your data between multiple stores. 3) Split your data, use SQL for transactional things and NoSQL for it's specialty. This is probably the most common use case as you're getting the best of both worlds here. Let the SQL database do what it does best, usually transactions and speed of development with the great tool support. Pick a specific NoSQL data store and let it do what it does best. Perhaps a graph data store to handle relationship data or a document data store to handle BLOB/CLOB storage. The really big drawback here is that you're splitting your data. Whenever you do that, consistency becomes a real issue though this may be tempered by the character of your data. Companies handle this problem in a variety of ways, but that's a whole discussion all by itself. 4) Use map/reduce on NoSQL to process data, then feed results back to SQL or NoSQL. This is also a very common use case. This could be either a variation or enhancement to item 3 depending on who it's used. Again, we're using each data store type for it's strengths. If you feed the results back to your SQL database, then you're mostly avoiding the consistency problem of split data. Otherwise, you're going to have to deal with consistency problems as in item 3. The big advantage here is that you have the most flexibility with this setup. You can process or otherwise transform your input data into a more usable form for your application then import it into the data store of your choice. Map/reduce is your best friend here. You need to remember that you're going to add some latency to your data flow because of this process flow. This is an interesting data store I came across. It looks like it fills a similar roll to Apache Zookeeper. HBase uses Zookeeper in order to manage multiple nodes. While Zookeeper is written is Java, Doozer is written in Go with clients in Ruby and Erlang. It looks like the comm protocol is a combination of 9p (Plan9) and Protocol Buffers. Interesting. Doozer's focus is on providing a highly-consistent and highly-available data store. To quote "Doozer is a highly-available, completely consistent store for small amounts of extremely important data." Sounds like it's worth a look. This is definitively an interesting article. I'm a java developer by trade but am learning Erlang as well. It's a real mind-bend going from an imperative to a functional language. You really have to understand how each style of language wants to work in order to get the most out of it. It's much more than just syntax. There are several NoSQL data stores that are written in both of these languages as well as map/reduce in both languages. I'm pretty familiar with how the Java VM works and am interested in learning more about the Erlang VM and how this affects each of these data stores. This is a pretty interesting article I just found on consistancy models. Great description on CAP tuning. Many times when you're inserting data into a NoSql style data store, you need to provide your own keys. There are several ways this can be done in Java. http://jug.safehaus.org/ seems to be popular and is what I’m using. You need to provide the hardware ethernet address on your own for type 1 UUIDs. http://johannburkard.de/software/uuid/ seems like an interesting alternative as well. It uses some OS specific utilities to obtain the hardware ethernet address for use in the UUID. UUID generation is pretty straight forward. These examples are for JUG. // Generate a type 1 UUID without a network interface reference. That’s all that is needed to get your UUID to use as a key in your data store. Next post we’ll look at using JDK 6 to get the network address to use along with the type 1 UUID.